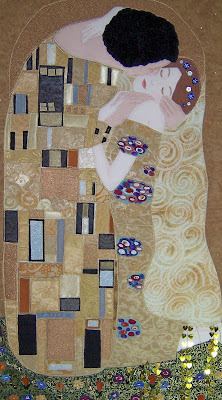 A few years ago, I made this fabric version of Gustav Klimt's "The Kiss" as a special order for a client. (You can click on photo for a larger version.) 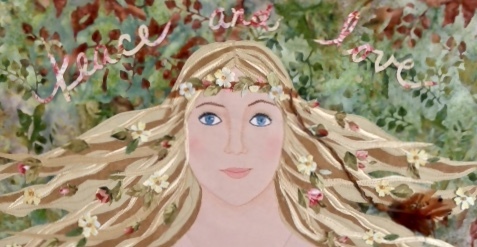 The finished version was about 30" long - a large piece of work for me. 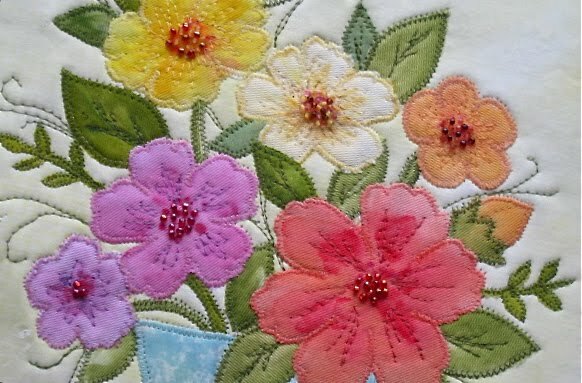 Here was my chance to use all kinds of fabrics, from cottons to sheers, and a great opportunity to embellish with beads, buttons and sequins. The end result was quite glitzy, and my clients loved it. They had it professionally framed, but I never did see the final result. It was a new experience to work on an interpretation of an artist's work. I do love the decorative quality of Klimt's work and some day I'd love to do a version of one of Matisse's paintings for myself.